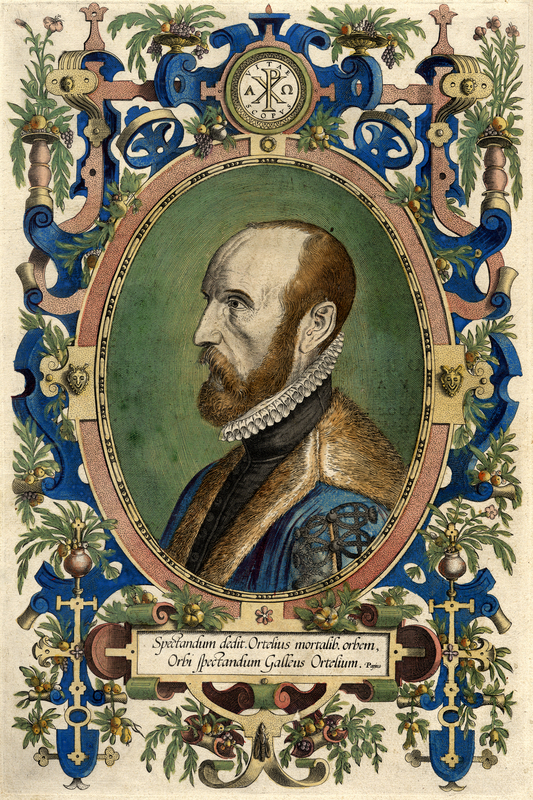 Portrait of Abraham Ortelius, 1527–1598. From his Theatrvm orbis terrarvm . . . (Antwerp: imp. C. Plantinus, 1579) [Rare Books Division]. Flemish cartographer Abraham Ortelius created the first modern atlas of uniform map sheets, Theatre Orbis Terrarum [Theater of the world], in 1570. Below the portrait, the Latin text says: Ortelius gave mortals the world to gaze at; Galle [Philippe Galle, the engraver] gave the world Ortelius to admire. [Below] Segment IV of Ortelius’s “Tabula itineraria ex illustri Peutingerorum Bibliotheca quae Augustae Vindel. Est.” Copperplate map in eight segments on four sheets, with added color, each segment 19 × 52 cm, on sheets 41 × 53 cm. From Petrus Bertius’s Theatrum geographiæ veteris, duobus tomis distinctum (Amsterdam: Ex officina Iudoci Hondij, 1619) [Historic Maps Collection]. Ortelius supervised the engraving of these sheets in 1598 but died before seeing them in print. Dutch cartographer Bertius added offprints of them to his atlas. Commonly referred to as the Peutinger Table, this is the oldest road map in the world. More accurately, it is a sixteenth-century printed copy of a thirteenth-century manuscript version of a fourth- or early-fifth-century map, which most scholars believe was a descendant of a Roman chart that was engraved in marble and featured in the Porticus Vipsaniae monument in ancient Rome. It is also probably the first printed facsimile of a classical map. (The source manuscript is now housed in the Österreichische Nationalbibliothek in Vienna, Austria.) The subject is the Roman cursus publicus, or network of roads originally created for the use of couriers of the emperors. It is definitely a thematic map showing various itineraries. Actually, it is rather sophisticated in its AAA TripTik–approach, using a right-angle hook to show a day’s travel and symbols for spas where one could expect to find water, food, and lodging. See, for example, the stretch from Rome to the coast along the historic Appian Way (Via Appia), highlighted in turquoise.